Uprise folding walker. Combination of folding walker and rising aid all in one. 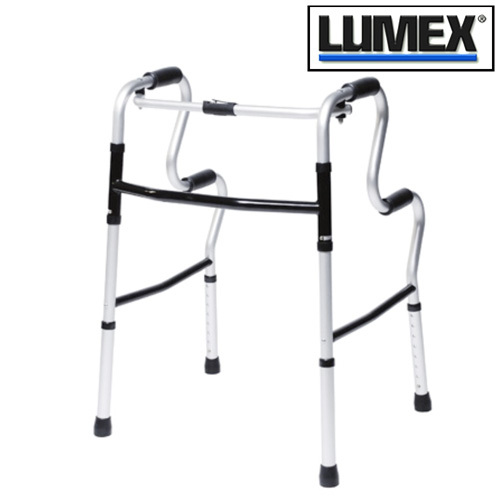 Secondary handles provide stable assistance from a seated to a standing position. Attractive, upscale Onyx finish. Single release folding mechanism is designed to aid users with limited hand dexterity. Can be used as a portable toilet safety frame. Durable aluminum tubing provides strength while remaining lightweight. Adjustable height fits a broad range of user heights. 400 lb weight capacity Contoured, plastic grips for enhanced comfort and a secure hold. Designed to meet the requirements of HCPCS code: E0135. Includes laminated color operating instructions. Limited lifetime warranty. Not available in CA. Sorry, expedited shipping is not available.